After a watermain break at Humber South postponed the Toronto Dingos and High Park Demons match on Saturday, both clubs were keen to get at it on Wednesday evening for the make-up game. The weather was gray all day, and rain was in the forecast, but it held off for the match allowing the two clubs to play in great conditions. The first quarter saw the Dingos trap the ball in the Demons defensive fifty, but inaccurate kicking kept the scores close. The Dingos racked up a whopping 8 behinds in the first term compared to only 2 goals, leaving the Demons a chance heading into the second quarter. After regrouping, the Dingos turned things around in the second quarter. Midfielders Michael Ladd and Mike Bocian were constantly the winning the ball out of the middle while ruckman Tom Bell gave the Dingos first use of the football. The Dingos halfback line of Ben Moller, Pat Bossey and Dan Gunn repelled the Demons’ attacks and created plenty of offense. At half time, the Dingos were well in front. Heading into the third term, the Dingo kept the pressure up and sought to put the game completely out of reach. Stef Cosma at centre-half forward presented all day and took numerous big grabs. On the forward flanks, Sean O’Reilly and Stephen Donnelly were dangerous taking marks and moving the ball inside the forward fifty. Visiting Aussie Ronnie Hobbs from Ellenbrook SFC got plenty of the footy throughout the day and even snuck in his first goal for the Dingos. The last term was a chance for the Dingos to move some players around and give them an opportunity to try out different positions. Alex Cataford contested well in the midfield, as did Christos Kaldis. Devon Dutt played the full final term in the ruck and battled hard throughout the term. Dan Gunn even snuck forward and got his second ever goal as a Dingo! Overall, the day belonged to the Dingos who took home a massive win. Best on Ground went to ‘Noddy’ up forward who kicked a bag of 9 goals. 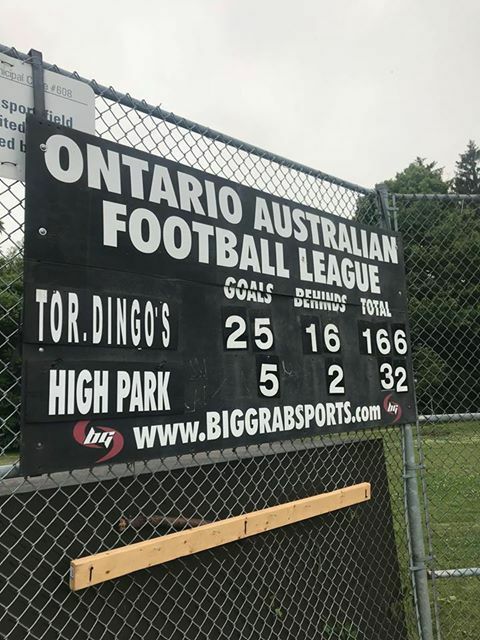 The Dingos take the Canada Day weekend off to rest and recoup, and then look forward to a rematch with Ottawa in Toronto.